By Admin in Resources on September 10, 2018 . Soraco Baby Potty saves hours of clean-up as your child is transitioning from potty to standing up to pee. Attach this light, bright urinal to the wall of the bathroom at just the right height and drastically reduce the time spent in the bathroom cleaning up after your little trainee. Tired of the misses and drips associated with transitioning your son from potty to standing to pee? This training tool is here to help! Standing to pee is more challenging when you have to balance on a stepstool to reach your goal! You can mount the Jorsam Baby Potty at the exact correct height so your son does not need a stepstool and can reach his target with ease…and we even include a target to encourage participation! Learning to stand to pee is more difficult when your goal is too high, leading to a messy, sticky experience. 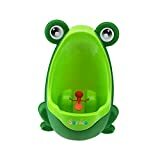 Attach the Jorsam Baby Potty at the right height for your son and watch his success improve along with the cleanliness of the bathroom.